Register your .biz domain name today! 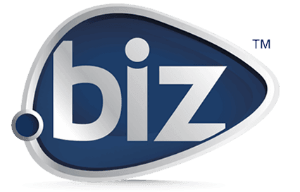 Show The World That You Mean Business With a .BIZ Domain Name. What's in a name? Plenty! Anyone who has ever searched for their top three name choices and ended up with their last resort, can tell you exactly what's in a name: Customers. Money. Results. If you want to generate business, get the right name with .biz. .biz is a shorter name. .biz is a better name. .biz is one of the most popular Top Level Domains (TLD) and gives you a better shot at Search Engine Optimization (SEO). .biz is brand value for your domain name. Oh, and entre nous, .biz doesn't stop at English. .biz is proud to offer international domain names (IDNs) in Chinese, Danish, German, Icelandic, Japanese, Korean, Norwegian, Spanish, Swedish, Finnish, Latvian, Lithuanian, Hungarian, Polish, and Portuguese. So, slainte, proost, banzai, salud, kong gang ul wi ha yo and cheers to your business! We'll see you online-because with your shorter .biz name, we'll be able to find you! How to start your .biz website? Find the perfect .biz domain name using our search tool. Register it in minutes! Publish your content and let our team help configure any needed settings to help you go live with your .biz website and email.